ON A BLUSTERY Tuesday afternoon, Marie Cullen is serving a customer from her fruit and vegetables stall on Moore Street. Cullen is a fourth generation street trader and has been selling her wares on the iconic street for several years. It’s hard work, she explains. The fabric of the street has changed greatly over the years. Where once it was a lively outdoor food market, it is now a shadow of its former self. In recent years, the street has been blighted by antisocial behaviour as well as a controversial development plan that has never come to fruition. As a result, the number of traders has dwindled and footfall has fallen. With many Dubliners avoiding the street or opting to shop elsewhere, Cullen says she counts foreign nationals among her best customers these days. “We’d be lost without them,” she says. In her view, the street needs two things: more policing and more vendors. With only fifteen traders left on the street, Cullen says she and her colleagues are the last of a dying breed. For the time being, Cullen will continue to ply her trade on the street – whatever the weather. It’s not nice working in the rain when you’re in an open market! However you do meet nice people and you do get a laugh every day. The job is absolutely different every day. Further up town, Helen Kelly is sitting beside her flower stall on Duke Street, smoking a cigarette and looking out onto Grafton Street. It’s a busy weekday morning with punters traipsing up and down the thoroughfare, occasionally stopping to look at Kelly’s impressive display of bouquets. “I’m here for most of my life, about forty years,” says Kelly. Her mother and sisters all worked in the trade and she followed in their footsteps. So who buys her flowers? Tourists or locals? With weeks to go until Christmas, she says business has yet to pick up for the festive season. Asked if there is anything the city could do to be more accommodating to traders such as herself, she has one suggestion. Due to her location, Kelly says she spends a lot of time fielding such questions. As for her favourite part of the job? Meeting people. And you’re able to smoke outside. For now anyway! Rose Draper has been a fixture on Camden Street for her entire life. Like the generations of women before her, Draper sells fruit and vegetables to passersby. She says the elements dictate when and how often she gets out. It’s hard in the winter, it’s a joy in the summer. One compensates the other. Over the years, she has witnessed the street undergo a significant transformation. During the recession, Draper says that a number of businesses on the street closed. In the meantime, the area has become chiefly known for being home to bars, restaurants and nightclubs and become a “nighttime street”. Draper says she would like to see more shops open in order to increase footfall during the day. Similarly, the demographics in the area have changed. “We’ve a lot more Europeans coming over here from all walks of life,” she says, noting that they are among her best customers. As older residents have died and family homes have been sold, the area has become home to more renters than ever before. This makes it difficult to establish a more permanent customer base, says Draper. With just three traders left on Camden Street, Draper says the future looks uncertain. For now, Draper is just hoping the rain stays away over the coming weeks. Yesterday was very bad, last week was very bad so I hope we get a bit of a break. Other than that, it’s back home to the house – to the cleaning! Email “'I've been on this street since I was in a pram': The stories behind Dublin's market stalls”. 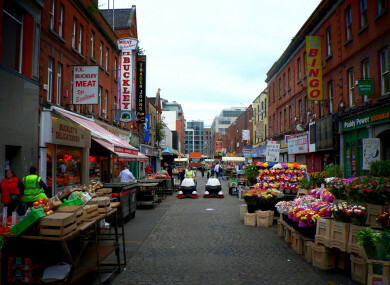 Feedback on “'I've been on this street since I was in a pram': The stories behind Dublin's market stalls”.